In my kitchen, is a cooling tray of gingerbread men, all ready to be bundled together for a little girl’s birthday. 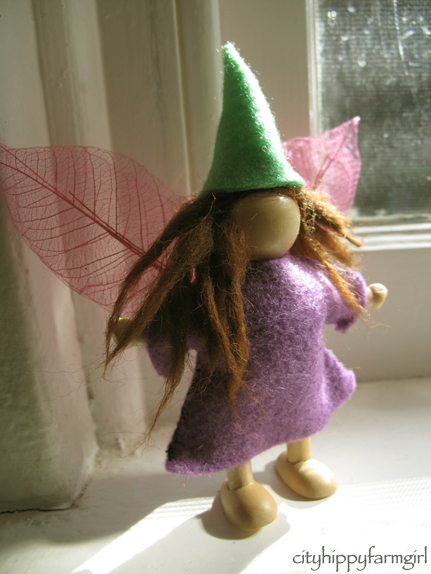 In my kitchen is a waiting patiently gnome fairy that needs a new home for the same little girl’s birthday. The wings are a little shonky, but I’m hoping she won’t be scrutinising. In my kitchen, is a whole heap of sourdough action. Portions of Suzie are being sent all over the neighbourhood, with less than satisfactory instructions of what to do with her (from my part.) Fingers crossed for everyone involved. May the sourdough gods be generous to all her new followers. In my kitchen is some slashing practise after reading Zeb Bakes’ very informative post. The thing is, I got nervous. I was about to start and I hesitated… I stalled….oh the pressure! I don’t usually think so much about the technique, so hesitating made it pull a little. Mr Chocolate said that looks really good, which was nice, but it wasn’t the look I was aiming for though. There will be a whole lot more slashing practising from now on. 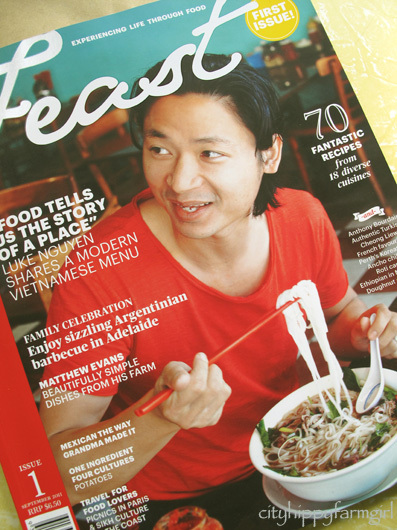 In my kitchen is the new ‘Feast’ magazine from SBS. I don’t get any magazines except for our gifted Sanctuary subscription, and I don’t watch so many cooking shows these days, but the magazine combines all that is wonderful from SBS, food, different cultures, and great articles in the one magazine. Loving it. Especially as there is a roti canai recipe in there that looks completely do-able, and so far the old roti has eluded me. 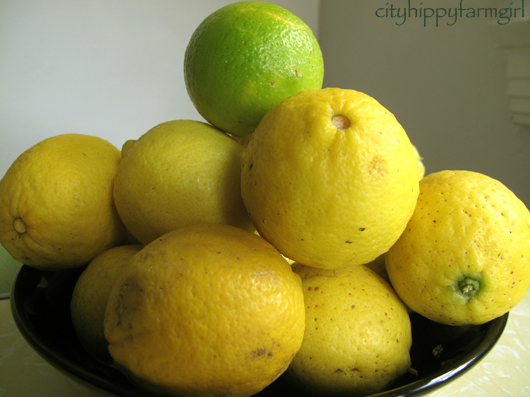 In my kitchen is a bowl full of my dad’s back yard limes, whispering words of marmalade, cake, and juice to me…. * The lovely Celia does a monthly round up of all things wonderful happening in her kitchen. Pop on over to see what’s happening in her kitchen for this August. This entry was posted in Rambles, Waffles and Digressions and tagged feast magazine, gingerbread men, gnome fairy, in my kitchen, limes, sourdough starter, wooden hand made doll by cityhippyfarmgirl. Bookmark the permalink. Beautiful slashing ! I think the best ones are the unexpected results sometimes, Mr Chocolate is right 🙂 I want to know how you make so many perfect gingerbread men, mine always crack and break and spread and in fact I have given up trying…. I have a lot of practising to do with the slashing now! I love this post. I also am jonesing for those limes. I could use a cookie too. Your bread looks great as always. Life would be tough without limes. Wow, wish you could be in my kitchen and be my little gnome fairy. I could do with the help at the moment. The bread and gingerbread people look amazing, I could almost smell them. Thanks Alison. I think everyone could with a little gnome fairy help now and then. Oh, lovely photos and what a good idea. In my kitchen, at this very minute nothing is happening, it’s all freshly cleaned and wiped and clutter-free. But later on… must do tests on the rice cooker as it’s not working properly, I’m sure. And later, there will be cupcakes as both little ones are having a friend over this arvo. Your yoghurt ones, I am thinking. Oooh, let me know if you do make them Seana. What is it with kids and cupcakes anyway? They are like magnets. From memory Hazel I think it was LSA in there (linseed, sunflower and almond meal), I like shaking in a decent amount or just the linseed meal is good too. Mess & mayhem compared to your kitchen!! Can I come on a little holiday to your kitchen some time? 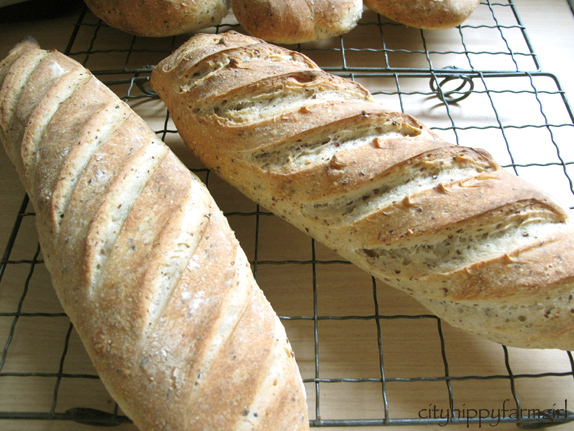 I love the gnome fairy…and I don’t know anything about bread baking other than what all the wonderful baker bloggers do, but your loaves(slashing) looks great! I’ve nearly used up all the lemons but hopefully there’s room for a couple for lemon meringues. Great August kitchen antics! Let there always be room for enough lemon meringue pies Yvette! I’ve never got into slashing so must have a little look at the article. 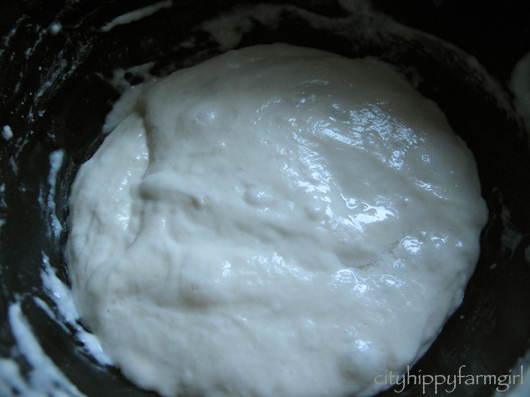 I do love how your bread looks and love the sound of a communal sourdough starter in your neighbourhood. I am curious to know if that is one lime with lemons (as I would think) or lots of limes in the photos – my tree gave me limes this year and they were yellow – I even cut into one thinking it was a lemon. But they were green inside. Nope all limes there. Some were yellow on the outside as well but the lovely limey green inside. I’m very excited about the copy of Feast hat is waiting for me back in Australia. I’m not sure if you read Libertine Eats. She is the one who wrote the article about Wild Sourdough. Love the look of the Gingerbread biscuits. Delicious. I don’t read Libertine Eats, but do know the name. I’ll have to have a proper look. The magazine is excellent! Oh my, I might have to chase down a copy of the magazine – Roti Canai and I am there. Have you tried Mamak in Chinatown. Their Rotis are fantastic. I love that fairy too. I am sure its recipient will be delighted. I haven’t tried Mamak, but have heard lots of good things about their roti. Mmmm roti. Really must sort out how to make them properly. I think your slashing is perfect! I have a couple of new recipes I want to try out – nothing quite as professional as yours though. I am looking forward to making a loaf in my own kitchen again. Have fun with the bread Mandy. It’s always good fun isn’t it…unless you forget the salt of course. Ahhh, my camera doesn’t have pictures like yours though! Busy kitchen! And a lucky little girl 🙂 Our kitchen is nowhere near as exciting, but does contain some bookmarked recipes in a ‘to try’ pile. Do you ever get to the bottom of your to try pile? Mine seems to be ever growing. It is a lot of fun hearing how people are using their doughs and getting such happiness from it. Loving that! 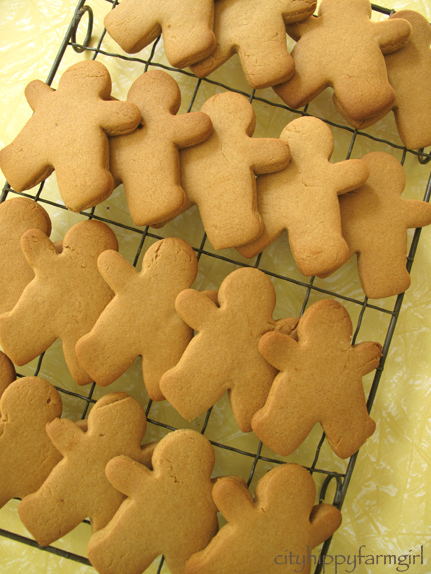 Oooh, now I feel all nostalgic after seeing those gingerbread men. I just love the flavour of them. Not the cake particularly but the biscuits are very special. And your slashing is perfection! Lovely post – thoroughly enjoyed the photos, too. Thanks for the kind words Misk. So glad you did one of these- and I love all the elements within your post and kitchen. Being a cookie maker- I love the gingerbread! But the gnome fairy, slashed loaves and limes are wonderful as well! You always have something magical and scrumptious going on in your kitchen, don’t you? Well done with the slashing, Brydie – it is something that I struggle to get right often. And I think your wee fairy is just beautiful as she is. I do love Celia’s In My Kitchen and now I’m getting a real treat and seeing what’s in yours. I’m finally in the process of constructing my own post and seeing your bowl of limes has reminded me about the bag of delicious apples my mother has just given me – so had better include that too. Hope your sourdough thrives around the neighbourhood. Mine has been sent off around the country, but I only know one who has managed to keep it going. Your little fairies are so gorgeous. Will have to get to a newsagent check out that new SBS mag! Thanks for sharing whats in your kitchen.